Global real estate portal Lamudi has today launched an Android app to help house hunters in Pakistan find property on the go. The app, Lamudi: Real Estate for Sale and Rent, hosts more than 400,000 property listings from Asia, the Middle East, Latin America and Africa. The app covers 28 countries from Lamudi’s global network - including Pakistan - giving international house-hunters a free mobile platform to buy, rent or sell real estate on an Android device. The launch of Lamudi’s Android app follows the successful roll out of the company’s iOS app in Pakistan last week. The iOS app is also currently available in Mexico, Colombia and Morocco, with more countries from the Lamudi network to be added soon. The Lamudi apps are designed to meet the growing demand for mobile internet services in the emerging markets. The recent State of the Internet report highlighted the pace of growth for mobile in these regions. In Asia, mobile now accounts for more than a third of all internet usage. Android remains the dominant mobile platform worldwide, according to recent figures from Statcounter. In Pakistan, Android has recently overtaken Nokia’s Series 40 as the most popular platform in the country. Android, the operating system developed by Google, now captures nearly 34 percent of the local mobile market. Lamudi’s Co-Founder and Managing Director, Antonius Salis, said: “Android is the future of the smartphone market not just in Pakistan, but worldwide. For this reason, we have focused on rolling out the Android app to Lamudi’s 28 countries to reach the maximum number of users with our unique property platform. Both the Android and iOS apps have customised search functions, allowing users to easily filter results by country. A key feature of the app is the match alert function, which notifies users as soon as a property that suits their needs is available in the market. Users can also create a list of favourites to bookmark properties, which can be accessed at any time and on any device. All the listings available feature high-quality photo galleries, detailed property information, maps, and multiple contact details for property owners or agents. House-hunters can also share their favourite properties with family and friends via Facebook, Twitter or email. Click here to download the Lamudi Android app today! Leading property portal Lamudi is going mobile, with the company today unveiling a new iPhone app for house-hunters in Pakistan. The app, Lamudi: Real Estate for Sale and Rent, features a wide selection of agency and property listings, giving global house-hunters a free platform to find real estate on the go. From today, properties in Pakistan, Morocco, Mexico and Colombia will be featured on the app. Listings from across Lamudi’s network of 28 countries in Asia, the Middle East, Africa and Latin America will be added in the coming weeks, giving international property-seekers a unique global platform for finding their next home. Lamudi has designed the app in order to meet the growing demand for mobile internet services in the emerging markets, especially Pakistan. A recent survey from International Data Corporation (IDC) showed that mobile was catching up to desktop PCs as Pakistani consumers’ prefered device for accessing the web. More than 75 percent of those surveyed by IDC said they frequently used mobile devices as well as PCs. Locally, mobile internet use has soared as the price of smartphones has fallen, while 3G internet services are being rolled out across the country. Lamudi’s Co-Founder and Managing Director, Antonius Salis, who is in charge of product development at the company’s headquarters in Berlin said: “Mobile is the next frontier for internet platforms like Lamudi since our focus is entirely on the emerging markets, where smartphone usage is soaring. The app’s filter options have been optimised to allow users to narrow their search by country. A key feature of the app is the match alert function, which notifies users whenever a property that suits their needs hits the market. Users can create favourites lists to bookmark their preferred properties. All listings feature high-quality photo galleries, detailed property information, maps, and multiple contact details for property owners or agents. House-hunters can also share their favourite properties with friends and family via Facebook, Twitter or email. Launched in 2013, Lamudi is a global property portal focusing exclusively on emerging markets. The fast-growing platform is currently available in 28 countries, offering 400,000 property listings around the globe. In Asia, Lamudi is on track to become the region’s number one real estate marketplace, with the platform now market leader in Bangladesh and Myanmar. 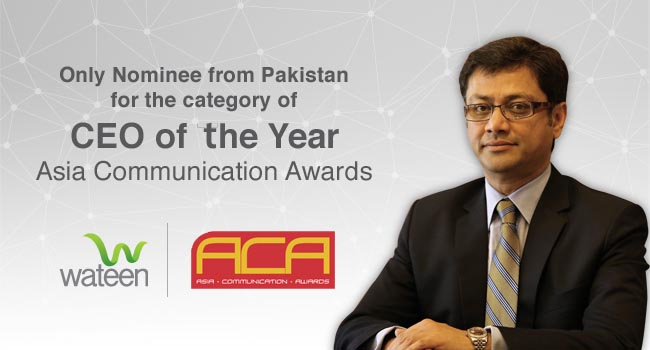 Mr. Naeem Zamindar, our CEO has been nominated at the prestigious Asia Communications Awards for the “CEO of the Year” award 2014. Mr. Zamindar is the only Pakistani who has been nominated amongst an illustrious pool of 18 CEOs from the telecom sector for this award. The ACA 2014 is organized by London-based industry publication Total Telecom and recognizes the remarkable triumphs achieved by CEOs of Asian telecommunications companies, highlighting their innovations in services, and industry success stories. Mr. Zamindar was shortlisted for the award along with 18 other Asian telco CEOs, following a call for nominations from industry members. Winners will be determined by an industry vote and assessment by a panel of judges. Copyright © 2015 PTETech. All rights reserved!! !.